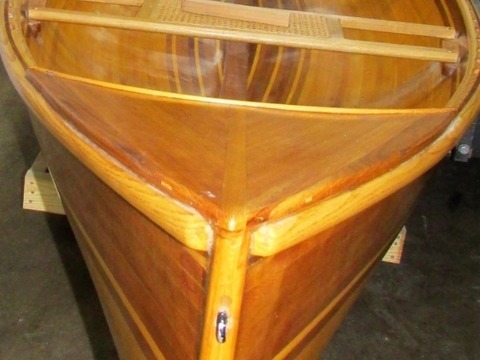 Beautiful hand made wooden sail boat made from popular mechanics drawings similar to the bonnie II design.Boat located in Newport RI in the water last season.All new wiring completely solar with 2 battery backup.Completely restored 2 years ago top notch, comes with custom trailer. Must sell, buyer responsible for picking the boat up or setting up delivery or transport.If you want a wood sail boat you will not regret this one. She is an awesome deal. 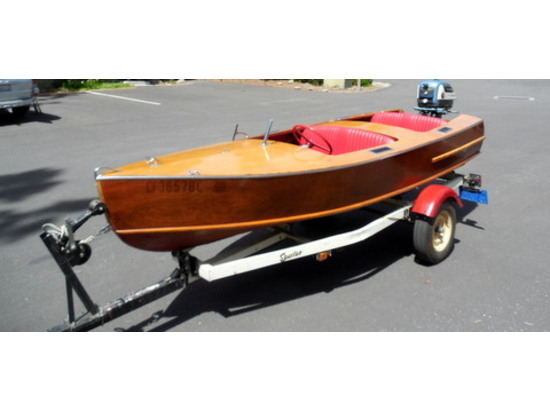 Excellent conditionComes with swim ladder , all sails, restored 4.5 hp Mariner motor and rigging. Being sold as is this is a COMPLETE boat. 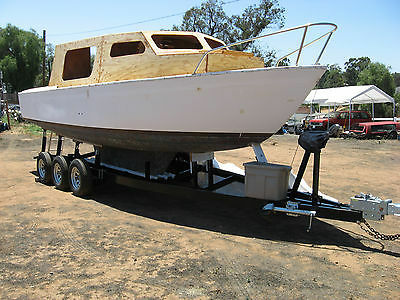 1989 Custom Morgancraft-17 CC This is a One Owner, hand layed-up fiberglass custom, with Foam fill between flooring and hull. The 25 gal gas tank is below deck as well. The hull design has its origins as the perfered design for the Harbor Patrol, and has Heavy Duty cool stainless steel Rails. Made for deep water yet is perfect for Fresh water fish & ski. The console is Full Size with top-end stainless steel and Rod holders. At the bow is a casting pedistal with anchor hold. It has a leaning post and captain's chair. A new 'used once' foot control troling motor by Minn Kota is mounted for easy in and out. At the center con is a FURUNO "COLOR" GPS PLOTTER/SOUNDER Mod.#GP 1650DF, Plus ICOM VHS Marine Radio Mod.#IC-M422 w/new 8ft mast antenna. All electronics are Mint condition. Console steering is Hydrolic for finger tip manuvering of the Mercury four stroke 115 hp (2001) that has been well cared for. The 115 replaced an original 80hp Merc. The 115 is smooth as silk, and is rigged with a stainless steel prop, plus has composit back-up in box. Overhead is a large Bimini top, yet leaves room for casting at front and back. Nice. 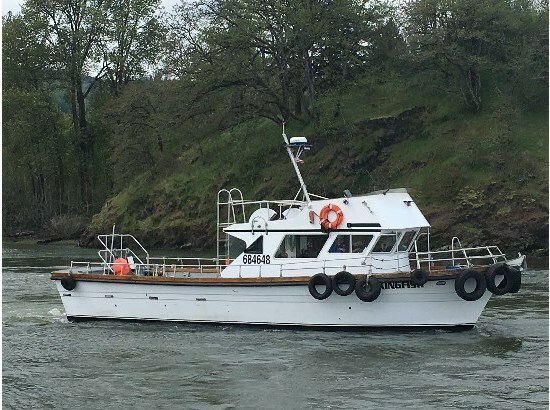 At the stern, inside, is a removable Bait Tank/Livewell and outside the stern, it has been fitted with Automatic Trim Tabs that were installed last summer. Also, there is a small "easy in-easy out" mount for a kicker motor, and a Teak swim step on the port stern side. The trailer is made by Trailrite and is galvanised, plus a spair. All tires are new as of my move to AZ July 2016 and it has been in storage since. Trailer tongue is removeable for anti-theft. (See Picture) Im only selling because my eyes have gone bad. Your luck, not mine. Take advantage of the Opp. It's worth $25K tricked out the way it is, but Closest Offer to my asking price, gets it. 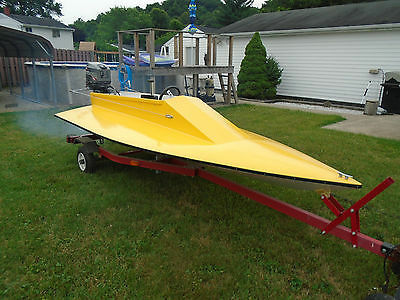 1985 CUSTOM The builder is Modutech, I am selling a 1985 Modutech charter boat. 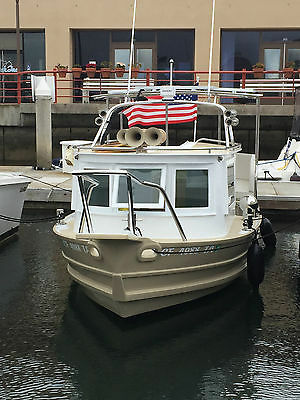 She is built for fishing charters and would make a great private boat. She is great to fish off of. Electronics includes: radar, sonar, chart plotter, 2 vhf, autopilot. Includes: Full fly bridge enclosure, fish/bait table, eperb, life raft, and other fishing gear (not shown in picture. She has COI for 18 passengers 2 crew members. She has a head and a bunk. Powered by twin CAT 3208's, top speed around 26 kts. She has a full aluminum rail with rod holders and is a very well maintained boat. Has a brand new hand made mahogany door that was installed since pictures. 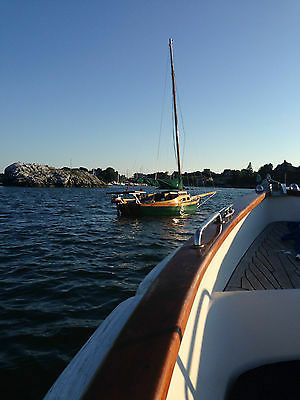 Bolger Light Schooner (scooner) PRICE REDUCED!! PRICE REDUCED! At this price, this boat is a steal. If you had this trailer made now, it alone would sell for over $2000. 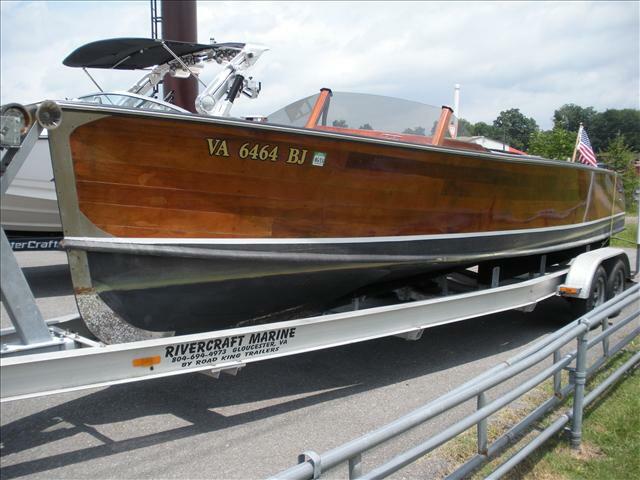 I know it's a buyer's market for boats, but this boat is very rare to find at all, let alone in overall good, complete condition of this one. 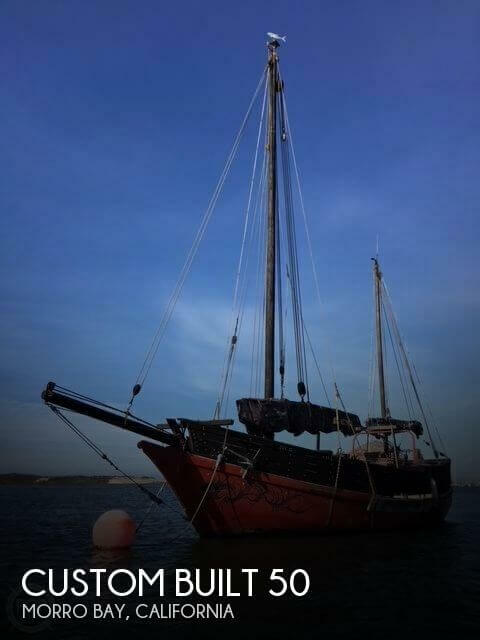 She just needs a couple of weekends of TLC and you could take her sailing! The boat is currently lying in Southern California. Registration in California for both trailer and boat are up-to-date. I have not sailed her in many years, but she has been sitting quietly under a good cover, waiting for more fun. And fun this boat is. Let me just say, one of my favorite memories of the many I have sailing this boat, is of a Fall day in the early 1990s on Lake Erie, just off-shore from down-town Cleveland. We had five adults aboard, it was 55 degrees with sun and clouds and a 15-20 knot breeze. The four crew and skipper found the port-and-starboard hiking straps very handy that day. I can see us now, all hiked out over the windward side, flying westward along the shore, blasting along on a broad reach under a steady northerly. Had we flipped her it would have been a cold 15 minutes, but this crew was fairly expert and sitting back aft, tiller extension in hand, I could not help the exhilarating feeling that we were about to become airborne. I've had some inquiries about the minimum space required to store the boat, its minimum footprint, in other words. Conservatively, I'd say you need at least 26.5 feet long and 6.5 to 7 feet wide to store the boat and move around it comfortably.. I built this little bald-headed schooner to a high quality standard in 1988-1990. Phil Bolger designed the boat for protected and semi-protected waters as a daysailer and rough-and-ready overnighter. She is featured in Dynamite Payson's original book on Instant Boatbuilding. Although, I can tell you that this boat was hardly instant! Note well: the boat and trailer include everything you need to go sailing. Nothing is missing. She draws about 3 feet with the daggerboard down. About 9 inches with the daggerboard up. I should also note that this boat is not a toy. She was made to be driven hard. She was created by one of the most talented boat designers of the 20th century and she sails beautifully on all points, with light weather helm to windward, and a very balanced helm downwind. The boat is built of mahogany doorskin quarter-inch plywood for deck and hull-sides. Half-inch out-door plywood for the bottom. I carefully inspected all panels for voids and flaws. Structural members consist of various appropriate soft- and hard-woods. The bowsprit and mid-ship stiffener on deck are of solid apatong. Booms and gaffs of clear, vertical-grain sitka spruce, custom-ordered from M.L. Condon. Tiller of mahogany. Masts of SPF two-by-fours laminated and hand-planed and sanded to shape. Masts are solid and totally bullet-proof. They have some weight to them, but are, nonetheless, easily stepped without much effort. The boat was built using the original Chem-Tech T-88 structural epoxy glue and Chem-Tech's sealing and laminating resin. Marine bronze anchor-fast nails and bronze screws used where appropriate. The entire boat is sealed in epoxy. The outside of the hull is sheathed in polypropylene cloth set in laminating epoxy, and finished with an epoxy paint no longer made, which has lasted the years quite well. The masts are sealed in epoxy. The booms and gaffs in marine varnish. Deck hardware consists of bronze cleats bolted through the deck and reinforcing stiffeners with stainless bolts. Rigging is best-quality line from West Marine, still in excellent, soft, pliable condition. Sails custom-made by Sail-rite, consisting of mainsail, foresail, flying jib and staysail. Wood-shell blocks are really beautiful and one size larger than necessary for the service, and should last forever. The boat has a motor-well, but I never used it. the boat goes nicely under paddle-power, and comes with four paddles. A little electric or gas engine of 2-5hp would be more than sufficient to power her wherever you want to go. The motor-mount itself is made of laminated apitong and is very robust. I fabricated a simple cover for the motor well, so that water doesn't slop in if you're not using an engine. Note that like many of Bolger's sailboats, this schooner has NO standing rigging. Once I got the hang of it, I could go from arriving at the ramp to sailing in under 45 minutes. And setting up a boat like this is part of the zen-fun of the thing. The boat includes wood brackets to hold masts and rigging inboard for trailering. The retractable daggerboard can be lifted part-way for downwind work (to lessen the chance of a broach), or all the way to beach the boat. The board has about 20 lbs of lead-shot in the bottom, which gives her a bit more stability for windward work. She still needs her crew to keep her right-side up in a breeze of wind, but is perfectly docile in lighter airs with just two aboard. I even single-handed her a few times in light-airs, with the mainsail reefed, and with two people and reefed main she's good in a breeze up to 15 knots, with care. The trailer was custom-made for the boat by Trailex of Canfield of Ohio to a superb quality standard. The trailer is made of extruded aluminum sections bolted together, and any part of it can be easily replaced. The trailer shows some wear and light oxidation from weather and years but everything still works fine, EXCEPT for the lights, which should be completely re-wired, and probably replaced. The buy-it-now price is quite reasonable. The trailer, sails, and all other materials and hardware in a big pile in your driveway would cost much more than my price. If you had her built today to an appropriate level of finish and quality by a skilled builder who understands this kind of thing, you'd easily spend $15-20K. Or more. See "Condition" note above for more details. Please ask any and all questions before purchase. I have described the boat as accurately as possible. I don't want any surprises for the buyer. I would really like to sell the boat to someone who will cherish her, as I did for many years. She needs a bit of TLC right now, but not all that much to go sailing! Hi, you're looking at a 2004 Polaris LE2100 Jet Boat. It is one of the nicest boats of its kind ever built. I am moving and this is the only reason I am selling it.Polaris, Baja Boats and Mercury Marine teamed up, designed and built this boat. It runs like a sports car on the water! They only built a few hundred before Polaris got out of the boating biz. They made two models, the LE2100 and the EX2100. The LE was the deluxe model and has beautiful lines and features. This boat was $40k new or more!The boat is powered with a Mercury Marine OptiMax 250hp motor and jet drive. You can be in 14" of water and cruise. The top speed is around 50, maybe a bit more. With the jet drive you can turn on a dime. It has a wide stance 8'5" beam and 18.5 degree deadrise so it handles the water well.The layout is amazing. It seats 9 adults! The upholstery is top quality throughout and I just had the back seats redone. The back seat is also a sunpad. It will hold 3. The portside seats two and swivels to the aft if you like. The captain's seat hugs your back like a sports car. There is seating in the open bow for 4 people. There is also plenty of storage under the seats, consoles and there is even a wake board or ski storage in the floor. The condition of interior and exterior: Interior is a 9 (of 10). I just reupholstered the back sunpad and back seat. The captain's seat and two-place seat are in great condition, as well as the bowrider seats. The carpet looks great because I take it out of the boat. Bimini top is in excellent condition. Gelcoat shines. Most people are blown away that this is a 2004. Many think it is new or a few years old. I do keep the cockpit cover on and front bowrider cover. So it is out of the sun. Exterior is an 8 1/2. Points are reduced due to some surface scratches here and there. Nothing major. A few scratches in decals too. Gelcoat shines right up. No blistering. No cracks. The hull is more of an ivory color and above the rub rail white. It is a real nice combo, very modern and rich looking. The boat is always on a lift and washed down. The engine has a flush port to rinse out any debris and salt water. Mechanically the boat is great. There is a newer battery. The boat fired right up after a few months of sitting. I have kept the OptiMax tuned up and it has been a great performer. Just had a computer scan, 174 hours on the engine.The helm has very large gauges. The steering and controls are very easy to operate. There are a series of toggle switches on the side that runs everything from the stereo, lighting, bilge pump, etc. It is all well laid-out! On the floor under the helm station is a built in footrest that provides a comfortable seating position for the driver and the single lever engine control is well placed for ease of operation.Back on the swim platform there's a ski hook that is built in for strength and an attachment for a ski pylon is also available. And the swim ladder has an ingenious step that lowers when pressure is applied. 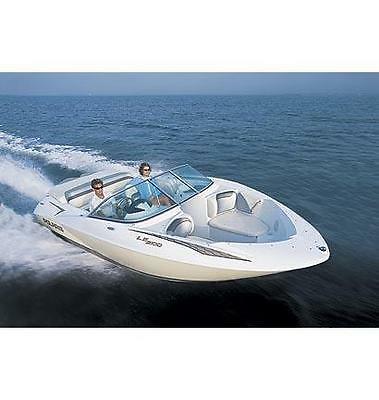 The boat can be used for wakeboarding, skiing or even parasailing! There is a walk-through windshield. On cooler days I keep the cover on the bow and windshield closed. It keeps out the cold winds. On hot days the boat is wide open. The stainless steel framed bimini top keeps the sun off the main part of the boat.Mechanically the boat rocks. It planes is 3-4 seconds. The OptiMax has 179 or so hours on her. Other than normal maintenance and a new battery, the boat has run perfectly! I have a fresh-water rinse port which is every easy to use. The bilge is huge, open on both sides of the motor, so access is easy. There is a sound cover that is also a firewall barrier that sits on top of the engine compartment.The 14" draft enables the boat to be easily beached and also makes running in shallow water possible. This feature allows you and your family to run the boat up onto the beach and enjoy the day at your favorite destination without having to worry about anchoring the boat. They use ½" thick balsa-core construction which helps in noise suppression and beefs up strength. And the high-quality gel coat and fiberglass is hand-laid for superior workmanship. The fiberglass on the boat shines up almost like new when detailed. There is a large fuel tank, 50 gallons or more capacity. The boat gets great fuel economy. I fill it up a few times a year.The boat has a newer stereo and 4 speakers with powered amp. Also snap-out carpeting, dining table and two covers, one for the front and main cockpit. The boat has a ship-to-shore radio with weather channels. I also have a custom trailer for the boat.Yamaha Jet boats and SeaDoo Jet boats do not compare to my Polaris LE2100. She is a real pleasure, as you'll discover if you buy the boat.I HAVE A YOUTUBE VIDEO I WILL SEND YOU. Just contact me in the lower left corner of this ad. I'm happy to answer any questions. Yes there is some negotiating room pricewise, but I have tons of interest too. Contact me with your thoughts or offer. This is a great boat, has been problem free and you'll enjoy it as much as I have! 1995 TDB17 The Duck Boat Original owner. Garage kept and used only in fresh water in local lakes. 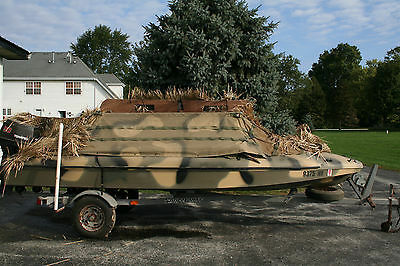 This boat is a duck hunters dream, safest boat available and built like a tank. Open floor model to hunt up to 3 hunters and 1 good size lab. All original canvas blinds, with quality, newly replaced grass material. decoy storage, gun and ammo shelves, built in gas tank, fuse panel. 50 HP Tohatsu Outboard. Excellent condition. |Started in the coldest weather every time without fail. Power tilt - runs circles around all other duck boats in the roughest waters. 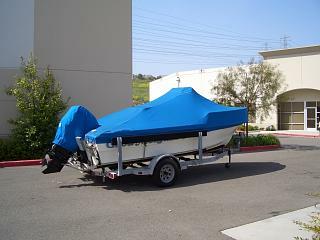 Also includes a custom made cover that allows trailering of the boat with the blinds in the up position fully grassed. Shorelander trailer with rollers and guide posts assisting with loading from rough waters. Call Mark @ 815 922 6300 with any questions. Additional roll of new fast grass camo material also included.